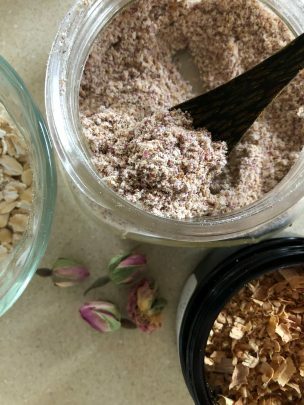 Blend Sandalwood chips, rose petals or buds, and oats in a nutri-bullet or coffee grinder and powder together. Take 2 Tablespoons of this mixture and put it in 2-4 oz. of coconut milk. Scrub on your skin prior to shower. This is absolutely lovely, it feels like a nice soft sandalwood scrub. You can purchase this lovely blend from me for $12.00 (+tax) or make it yourself with the links below. You can get sandalwood chips from me or here at Floraceopeia. You can get rose petals or buds here at Mountain Rose Herbs.